*WHAT: The Boys & Girls Club of the Capital Area is partnering with Henry Street Barbershop to provide free haircuts to veterans and individuals experiencing homelessness in the Collar City and Capital District. 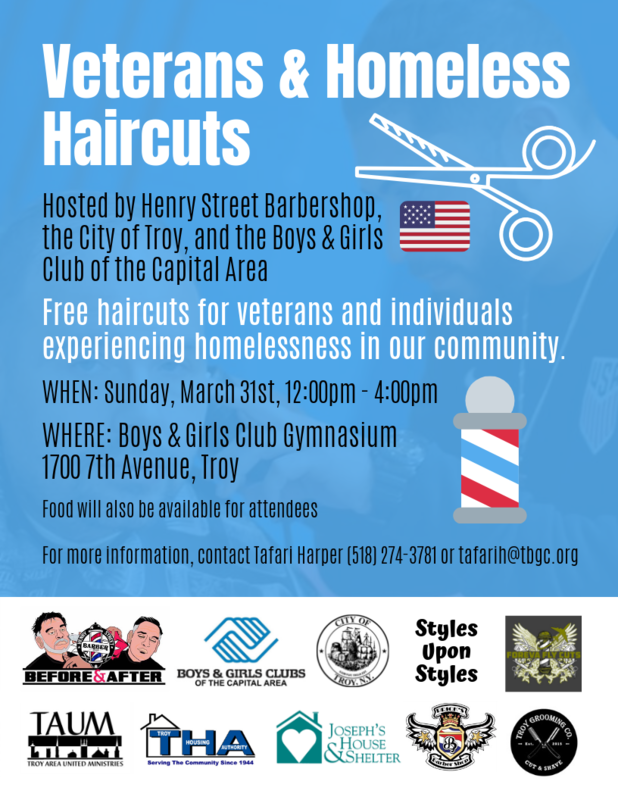 The 2nd annual “Before & After” Veterans and Homeless Haircuts event, co-hosted this year with the City of Troy, will be held from 12:00pm – 4:00pm, at the Boys & Girls Club gymnasium located at 1700 7th Avenue in Troy. Participants will have access to a meal through the Boys & Girls Club of the Capital Area’s Food Service Program. The event is co-sponsored by the Troy Area United Ministries, the Troy Housing Authority, and Joseph’s House & Shelter. The “Before & After” event is a monthly program organized by Henry Street Barbershop, which donates haircuts to homeless and veterans on the first Sunday of each month at their Saratoga Springs location. The Troy event will include participation from Brick’s Barber Shop (Albany, NY), and Troy-based Styles Upon Styles, Forever Fly Barber Shop, and Troy Grooming Co.